Annabelle Potts and her dad Adam during a visit to Clinica 0-19 in Mexico for treatment. Picture: Nathan Edwards. 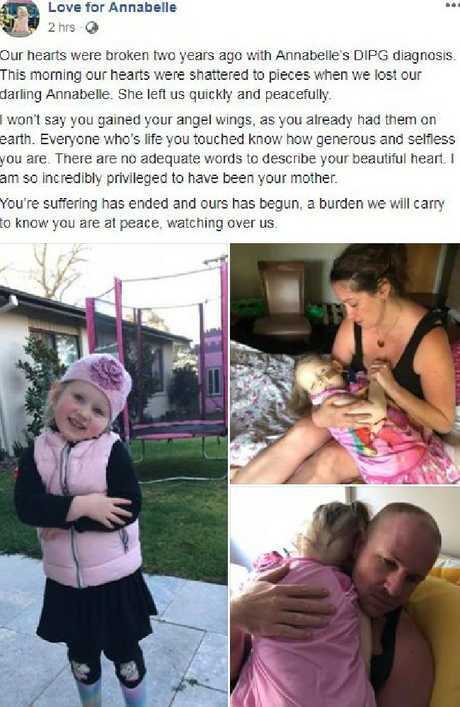 THE family of Annabelle Potts, 5, whose fight to find a cure for her rare brain cancer captured the hearts of Australians, has revealed in a heartbreaking Facebook post that she has died. 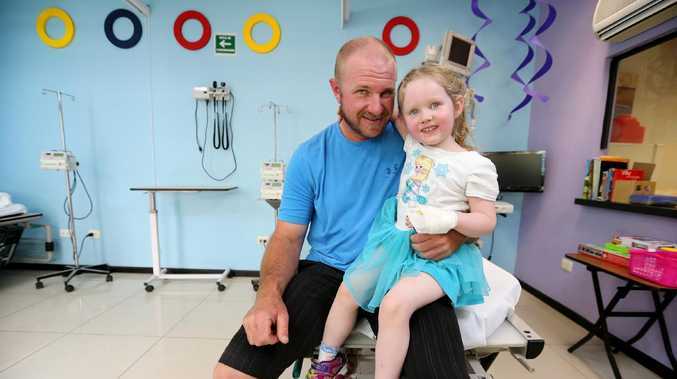 The five-year-old Canberra girl had travelled to Mexico several times seeking treatment since being diagnosed two years ago with the aggressive and inoperable Diffuse Intrinsic Pontine Glioma (DIPG). In a Facebook post around 7pm on Wednesday, Annabelle's mother Kathie Potts wrote that her daughter had died this morning. "This morning our hearts were shattered to pieces when we lost our darling Annabelle," Mrs Potts wrote. "She left us quickly and peacefully. "I won't say you gained your angel wings, as you already had them on earth. Everyone whose life you touched know how generous and selfless you are. "There are no adequate words to describe your beautiful heart. I am so incredibly privileged to have been your mother." 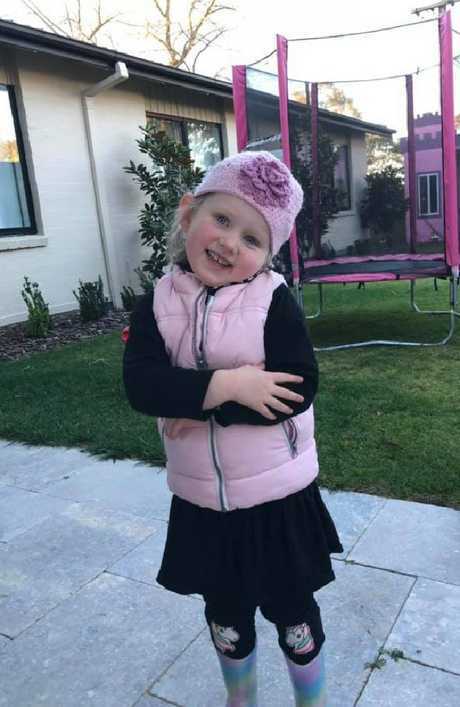 ‘Our hearts are shattered’: The family of Annabelle Potts, 5, (above) has posted on Facebook that she has died from cancer. Mrs Potts added, "Your suffering has ended and ours has begun, a burden we will carry to know you are at peace, watching over us." In June 2016, Kathie Potts saw her then three-year-old daughter have bad dreams, then dizzy spells and violent outbursts. Australian doctors diagnosed DIPG, a highly aggressive, extremely rare and difficult to treat brain tumour located at the base of the brain. 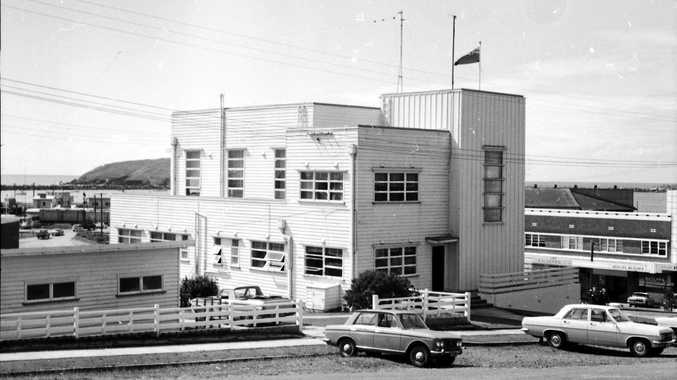 They refused to operate on the cancer, citing the size and location of the tumour, and told the Potts family to "go home and make some memories with Annabelle". 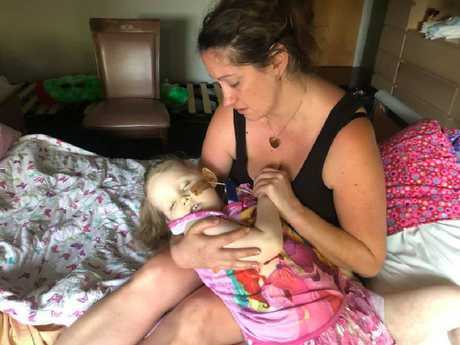 Kathie and Adam Potts were determined to try and find a cure for their daughter and flew several times to Mexico, where her treatment was unsubsidised, at $33,000 a trip. Annabelle's plight touched Australians who donated money to contribute to the family's bills. Kathie Potts (above with Annabelle) posted ‘I am so incredibly privileged to have been your mother’. The heartbreaking Facebook post by the Potts family after Annabelle, 5, died from cancer of Wednesday.